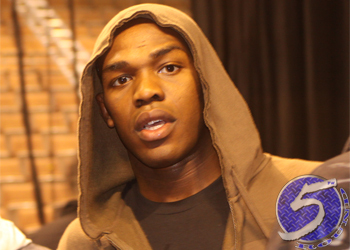 After beating his fifth consecutive former UFC champion to post his fourth straight light heavyweight title defense within the span of 18 months, most pundits believe Jon Jones (Pictured) has already waxed his division completely clean. However, after submitting Vitor Belfort at UFC 152 on Saturday, Jones professes he still has some loose ends he needs to tie up before he leaves the 205-pound class in his rear-view mirror. Most notably, the “old man” who was forced to withdraw from their September 1st showdown with a blown knee. The two were set to tango at UFC 151 until Henderson was forced to bow out at the 11th hour. Hendo’s knee won’t require surgery, but he will be forced to ride the pine for the next three to four months rehabbing it. Speaking of injuries, Jones needs to have his right elbow examined before he can return to action. For the first time in his young career, Jones stared defeat dead in the eyes. Instead of tapping to Belfort’s tight armbar, the skyrocketing superstar powered through and managed to somehow prevent the snap. However, Jones appeared at the post-fight press conference with his arm wrapped in a sling and bolted for the hospital immediately after the presser. If Jones vs. Henderson is the matchup UFC officials still want to go with, “Bones” was a whopping 9-to-1 odds-on favorite against the 42-year-old before he got hurt.